Alaska Airlines Los Cabos-based employees greet passengers on Alaska’s first commercial flight since Hurricane Odile hit on Sept. 14. Alaska Airlines passengers on flight 236 received a special welcome when their plane landed in Los Cabos early this afternoon. They were met by a cheering crowd of about 100 people including two dozen Alaska Airlines employees, a mariachi band and tourism and government officials. The special flight marks Alaska’s return to Los Cabos after the region and airport were damaged by Hurricane Odile on Sept. 14. 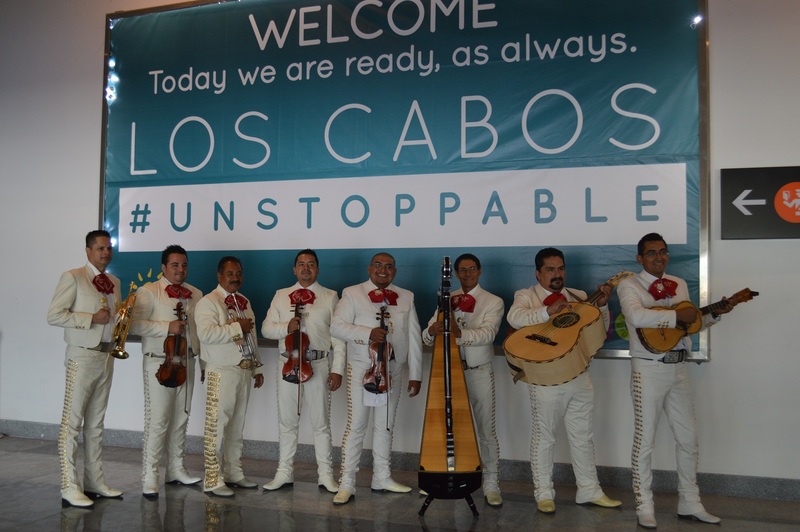 Since then local hotels, restaurants and businesses have been hard at work cleaning and removing debris and repairing the Los Cabos International Airport, which officially reopened for international commercial service today. Alaska Airlines will operate one daily roundtrip flight between Los Angeles and Los Cabos and will add another three weekly roundtrip flights starting Oct. 23. In addition, service between Los Cabos and San Jose will resume on Oct. 23 with four weekly roundtrip flights. Ticket are available for purchase at www.alaskaair.com. While many homes and businesses were damaged and destroyed by the hurricane last month, Aguilar said locals were surprised to see the beaches covered in soft, new sand from the ocean floor. Customers with tickets to Los Cabos have a variety of options to rebook their travel or request a refund. To learn more, visit our travel advisories page at alaskaair.com.